I'm still thinking about John Szarkowski, and his gifts to the world of photography. Especially his notion that photographers are pointers. They want to show you what they saw, asynchronously. First, capture the moment. Then, find the memory in the image. Finally, share it, and make one three-hundredth of a second seem timeless. This is Silas, stealing the sidewalk show. And making a point. He stopped me in my tracks, and stopped time in the process. 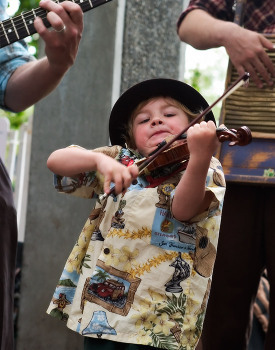 As the ad hoc leader of Red Brown and the Tune Stranglers (Red didn't make the date), Silas stepped up big time, and drew the crowd in for the rest of the band, delivering some of the finer moments at 2007's NWFL Festival. While there was no doubt he was working it, was he actually playing the violin? Can't say, really. Did he have the best moves on the entire Fisher Pavilion promenade? Absolutely. Was he flat out fronting the band. For sure. Sometimes it just doesn't matter. There's more here than meets the ear, much less the eye. And that's Silas' point. and the words were good too!